Culver used Branstad’s name 16 times during a nearly seven-minute-long conversation with reporters, adding that his own record had been distorted. “Terry Branstad’s been making a lot of false charges and I want to correct the record straight,” Culver said. Culver criticized Branstad’s call for a 15 percent cut in the state budget, saying it would lead to deep cuts in priority areas like education. When a reporter asked if a Culver/Branstad match-up would be a “bare-knuckles brawl,” Culver said it would be. “Yeah, and I can’t wait. I love a good fight,” Culver said. “We have a lot to fight for. We have to fight for civil rights. We have to fight for workers’ rights. We have to fight for women’s rights. Terry Branstad wants to require every woman to have an ultrasound before she makes a decision on her own health care. I mean, it’s really radical.” The state of Oklahoma has a new law which requires women seeking an abortion to be shown an ultrasound first, and Branstad has said he’d support a similar law in Iowa. According to Culver, he will run a “well-organized and efficient” reelection campaign. “Terry Branstad talks about the fact he’s never lost — I’ve never lost,” Culver told reporters. On Monday evening Branstad told supporters who gathered at his campaign headquarters that he has a 10-0 record in elections and intends to make it 11-0 tonight. 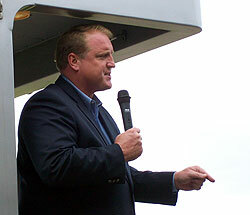 Culver won two terms as Iowa’s secretary of state before being elected governor in 2006, so that’s a 3-0 record.